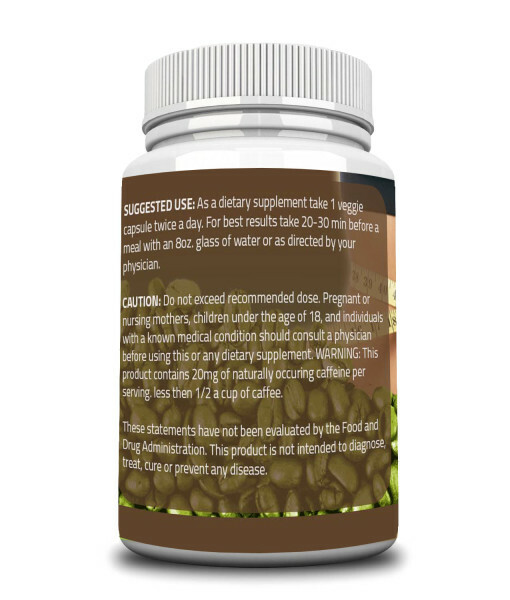 – Simple to use formula; just two all natural premium Green Coffee Bean Extract veggie capsules per day! 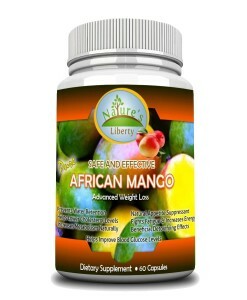 Weight management is essential to good health, but many people struggle to lose weight through diet and exercise alone. 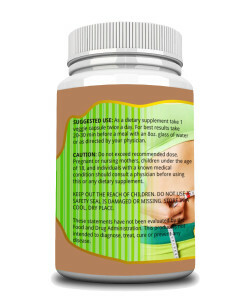 If you’re struggling with weight loss, your metabolism, not your diet or lifestyle, may be to blame. 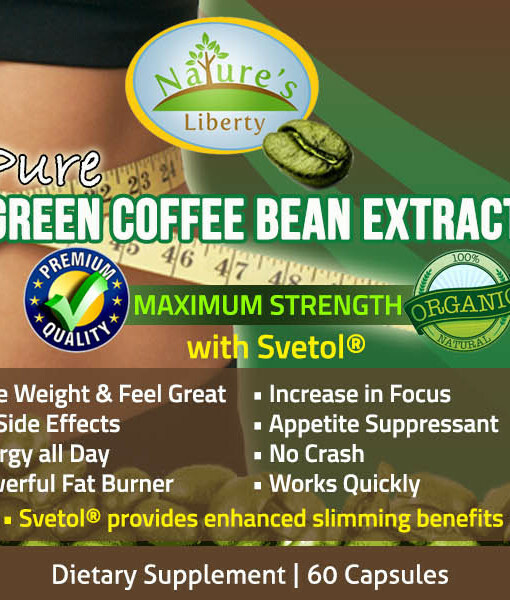 Fortunately, you can take steps to support fat burning and see real weight loss results from Nature’s Liberty Green Coffee Bean Extract with Svetol. 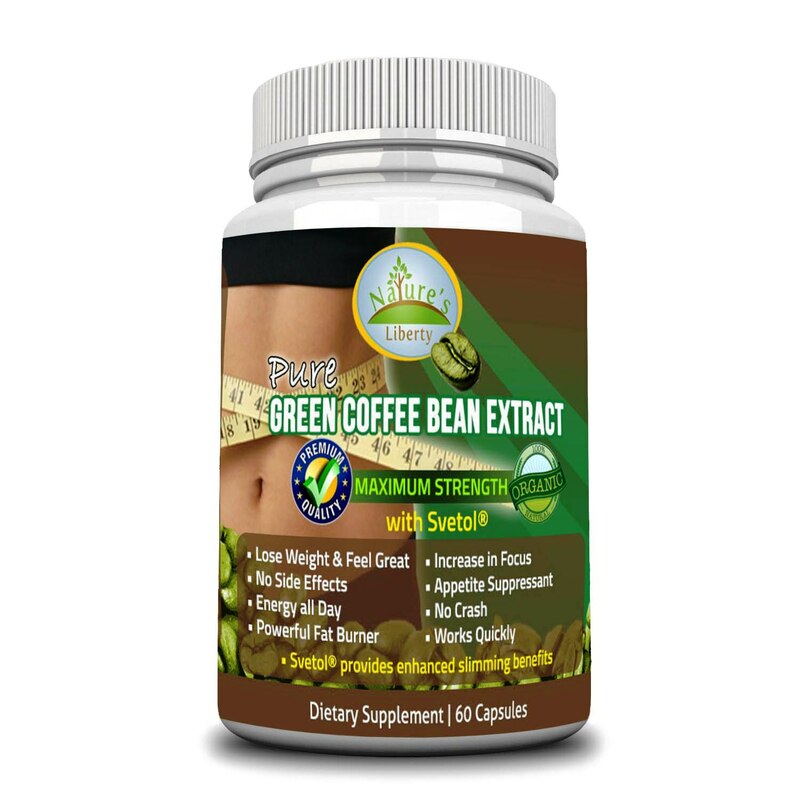 In clinical studies and as recommended by Dr. Oz, premium Green Coffee Bean Extract has been shown to help people lose weight by promoting the burning of stored fat and helping to reduce the amount of glucose that the body absorbs from foods. 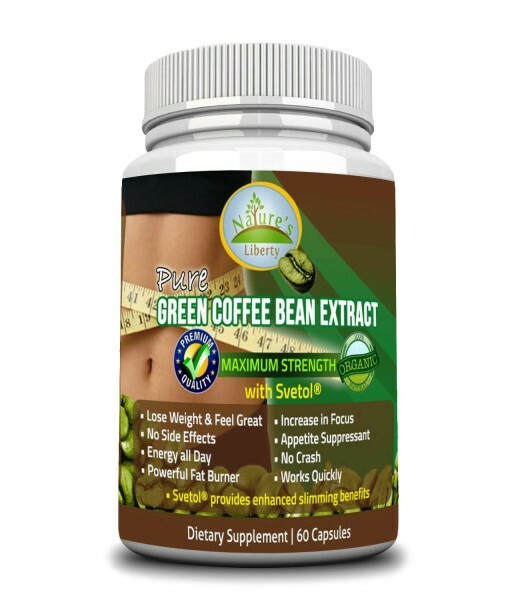 The benefits of Green Coffee Bean Extract have been touted by physicians and major news publications around the country, and now, you can get the benefits of this breakthrough dietary supplement for weight loss. 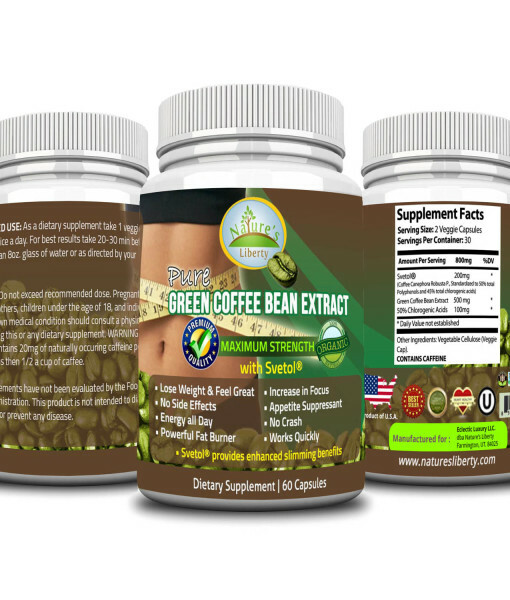 If you’re looking for the best Green Coffee Bean Extract supplement, you’ve found it in Nature’s Liberty Green Coffee Bean Extract with Svetol. 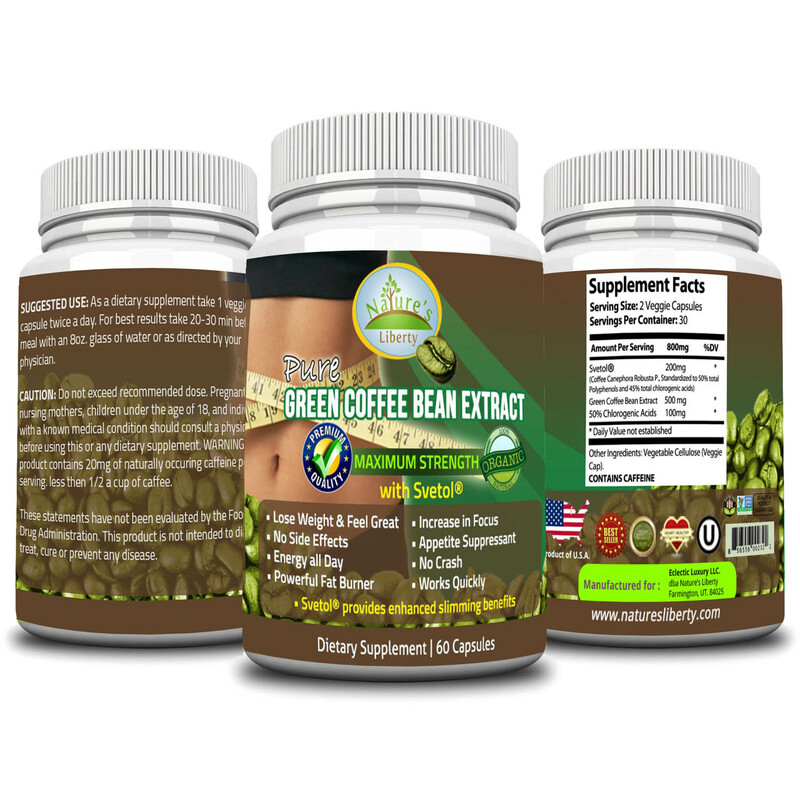 Each serving of this premium Green Coffee Bean Extract contains 100 percent pure green coffee bean extract plus chlorogenic acids, the natural chemical found in pure Green Coffee Bean Extract that assists with weight management. 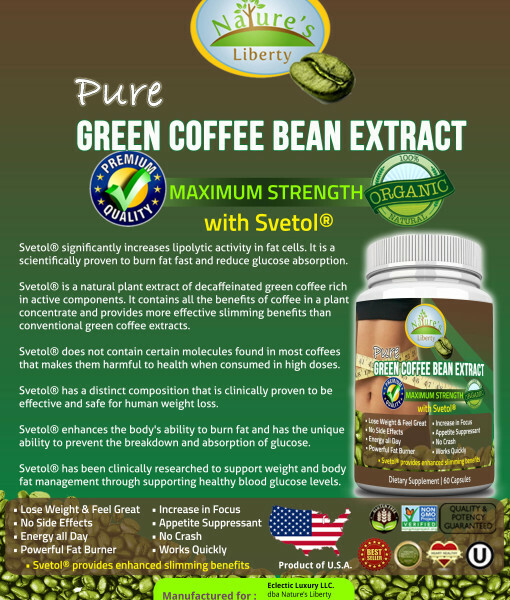 Plus, Nature’s Liberty is the only brand that contains Svetol, a plant extract from coffee that maximizes the benefits of green coffee bean extract. 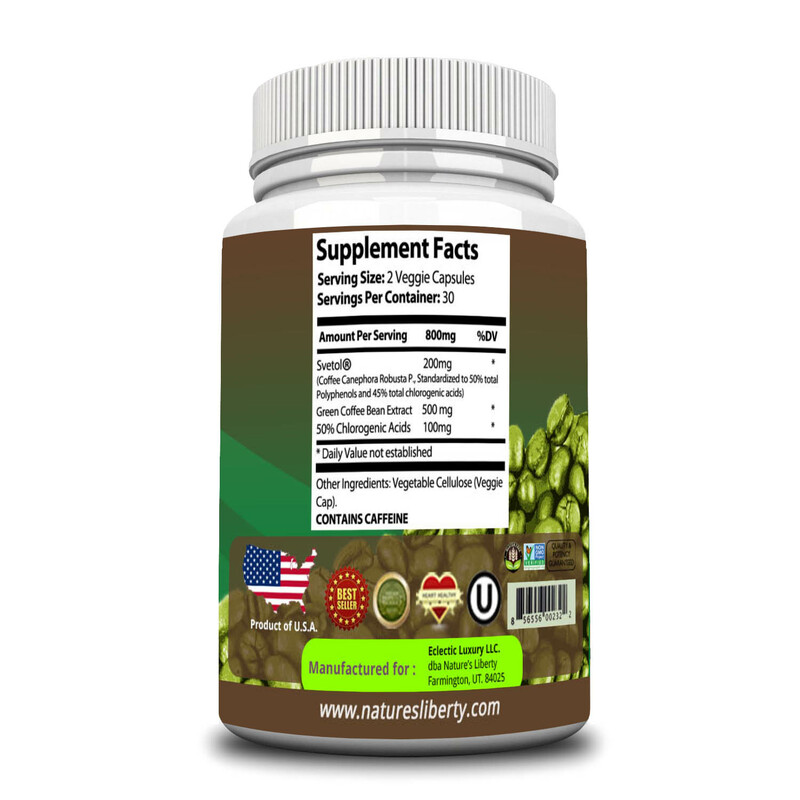 This unique combination of 100 percent natural organic ingredients makes Nature’s Liberty truly the perfect Green Coffee Bean Extract for those who want to lose weight and feel great. 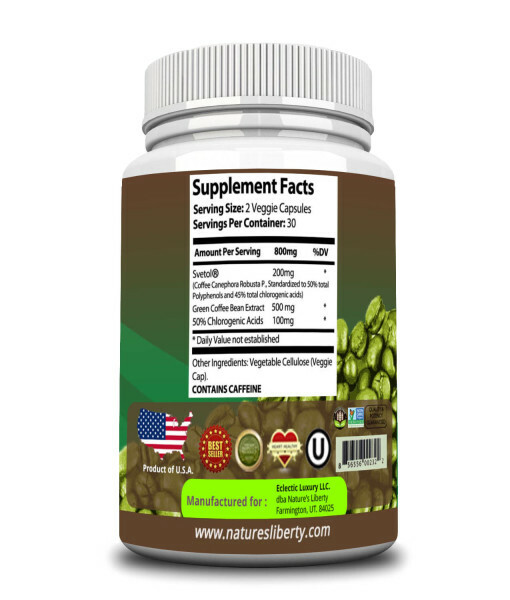 With Nature’s Liberty premium Green Coffee Bean Extract, you’ll find that your appetite decreases and your energy level increases, making it easier for you to make healthy food choices at meals. 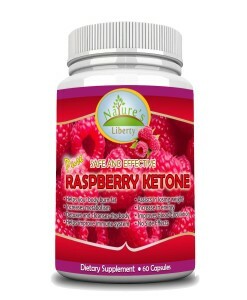 This formula will also support your metabolism and assist with blood glucose control. 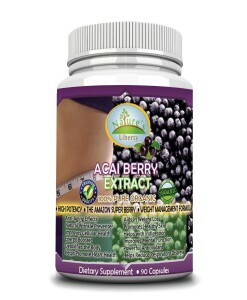 Best of all, this supplement works quickly without causing side effects. 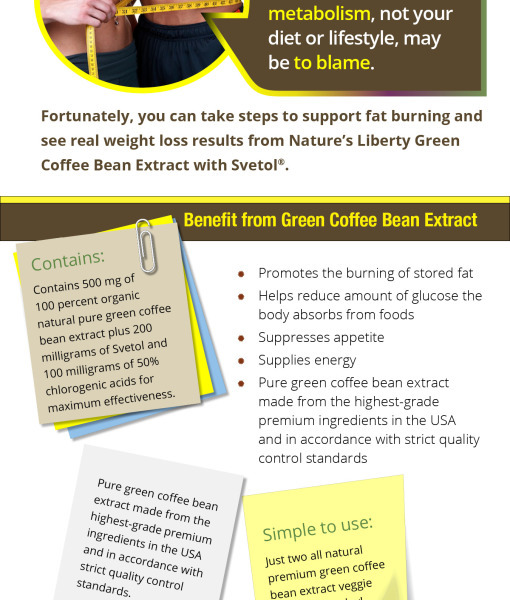 If you’re ready to take control of your weight loss plan, order Nature’s Liberty Svetol Green Coffee Bean Extract today. 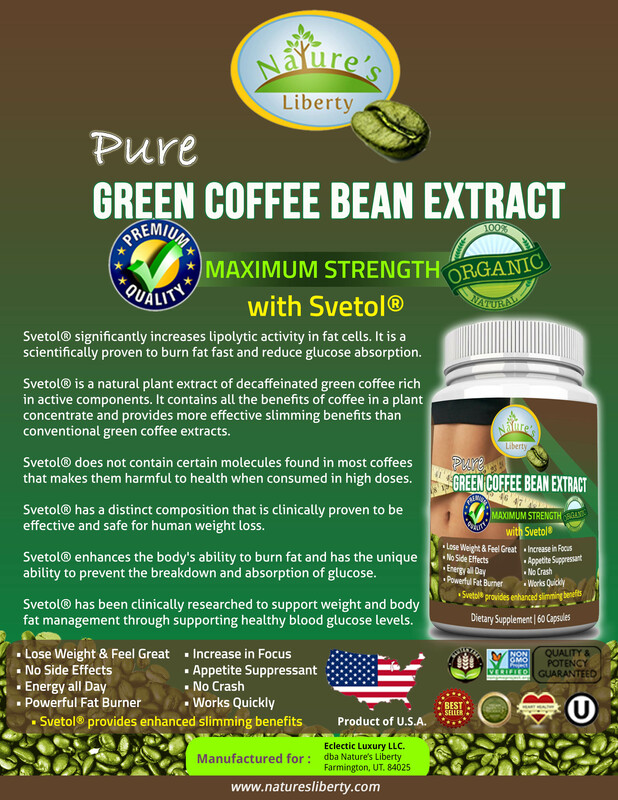 I learned about Maximum Strength Green Coffee Bean Extract with Svetol from Dr. Oz. 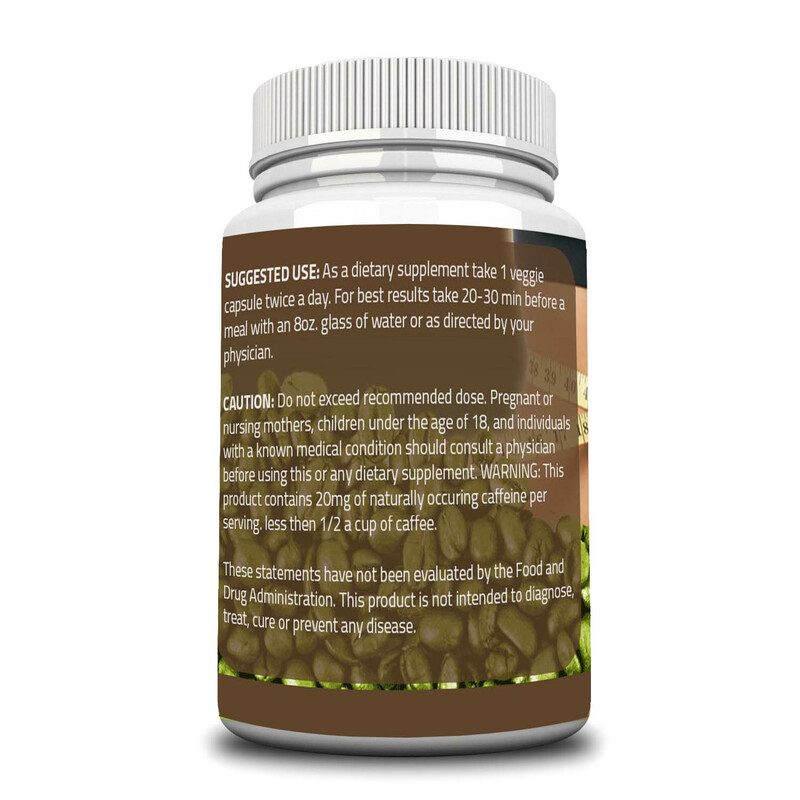 He is my most trusted source for supplements because I have always had great success with whatever he recommends in the past. While everything has worked well, he’s always introducing the latest and greatest, so I had to run and try some. 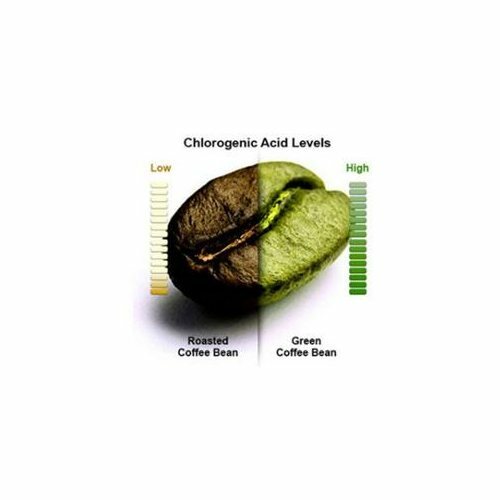 This Green Coffee Bean acted as a powerful fat burner for me. 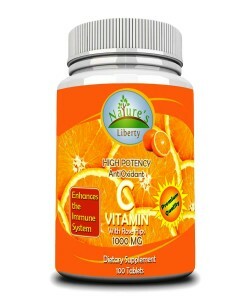 I don’t feel jittery or have any side effects. I was able to lose 20 pounds in only 12 weeks which is about as good as it gets while still being safe according to my doctor. 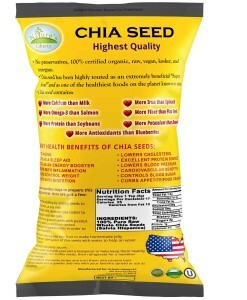 Furthermore, I’ve seen an overall increase in my cardiovascular health and decrease in my blood pressure. 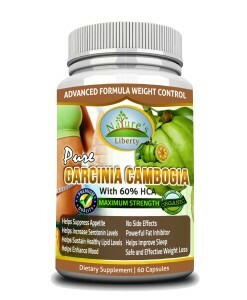 None of the other weight loss supplements I have ever tried in my life did that! 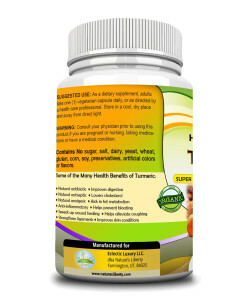 My doctor told me why this supplement is working so well for me. 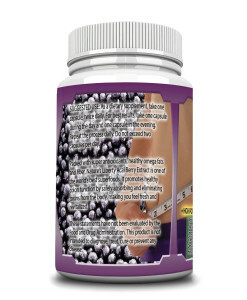 He explained that the supplement increases the metabolism while decreasing glucose. 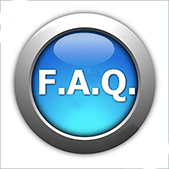 Your body can only store and use so much glucose before it turns it into fat. Makes sense to me! It’s real science and it has really worked great for me. 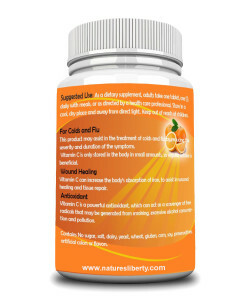 I’m so thankful for this company and product. 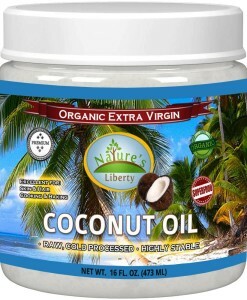 The price and quality for this product is great! 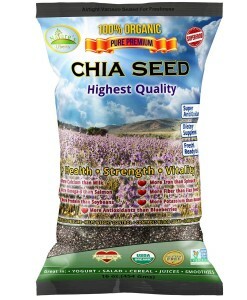 I have been looking online for the best quality and deals and stopped here! Can’t wait to get my refills. 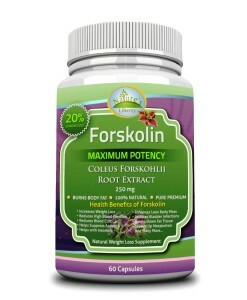 I first heard about this from Dr. Oz. as well. 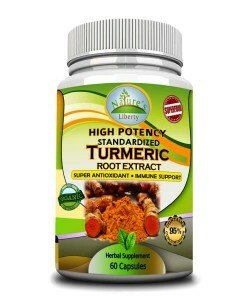 I was not sure what to expect, but for my body, I have noticed very good results with no side effects. I hate side effects and when they are associated with something that you take each day, it makes me leery that I should be trying it. 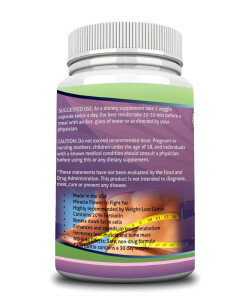 I have not experienced any side effects. 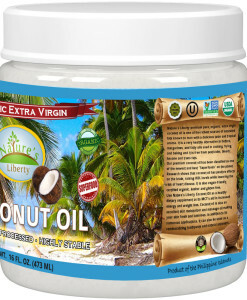 Great product, fast shipping, very affordable supply!